The range of the American bullfrog is eastern and central USA, New Brunswick and Nova Scotia. The American bullfrog prefers ponds, lakes, and slow-moving streams with sufficient vegetation for cover. Bullfrogs are nocturnal. Although primarily aquatic, if frightened they flee to nearby vegetation as often as to water. 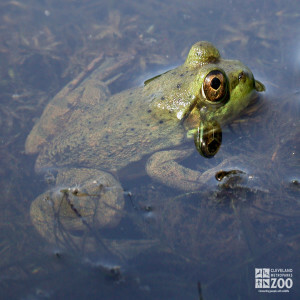 North American bullfrogs prefer warm weather and will hibernate during cold weather. The bullfrog's breeding season is from May to July in northern areas, and February to October in southern areas. Aggregations of males will call in chorus to attract females to the breeding site. The egg masses are attached to submerged vegetation. They must not be incubated at temperatures above 82 degrees. Most such eggs develop abnormally and die. About 4 days after fertilization, tadpoles emerge with gills and a tail. Tadpoles mature slowly, taking 1 – 3 years to reach adult stage (depending on location – a few months in the south, 3 years in Nova Scotia). These frogs breed once a year and there is no parental involvement after the eggs are laid. Insects, crayfish, minnows, other frogs. Larger specimens have eaten small birds, young snakes, small mammals.